I do love when my jewelry matches my shoes and an outfit comes together making me look cool, elegant and coordinated! The same for my gifts. I love when I have a coordinated card, envelop, bag and stamped tissue paper! I placed a large order of paper bags in a variety of colors and sizes. (Paper Mart and it was a great price and easy on-line access.). I use the bags for gifts, parties, class and sports or troop treat bags and my classes! Here is a bag that coordinates with the Your Amazing in Pink card that I posted earlier today. 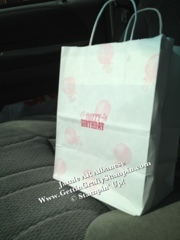 Here is my white bag with Pretty In Pink hot air balloons from the Your Amazing stamp set. The Melon Mambo Happy Birthday is just too cute! (I'm loving this stamp set!). With plain gift bags I can pull together a gift to look amazing! 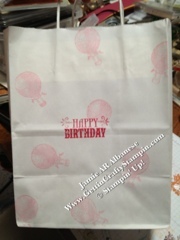 I hope that you will have fun making your gift bags coordinate with your cards!! I love the look and the savings to boot!